Welcome to the Iron Mountain Estate! 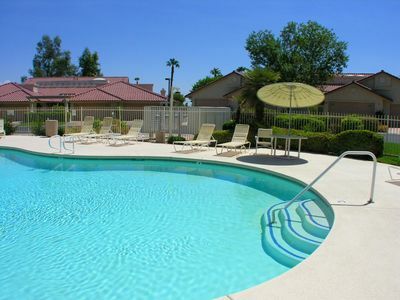 Book your family vacation now for the summer - great rates, reliable weather, California Misters to keep you cool all around the patio, air-conditioning, and fun activities such as hiking, golf and water-slides nearby. 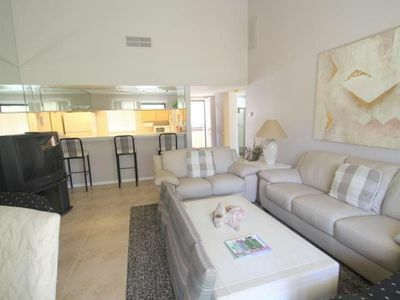 This is our 5th Vacation rental Home in Palm Desert. We have over 350 Five-Star reviews of our Holiday Home Rentals. We keep our calendars up-to-date. 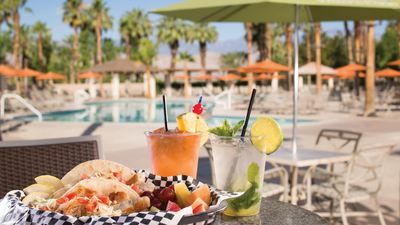 Reserve with us and reserve with confidence - all of our Holiday Homes have short-term rental permits issued by the City of Palm Desert. We completely renovated the Iron Mountain Estate in October 2015 with the highest quality materials. You'll find Kohler, polished Italian Travertine, Restoration Hardware Crystal chandeliers, Bose, Sony, Z Galleries and more! 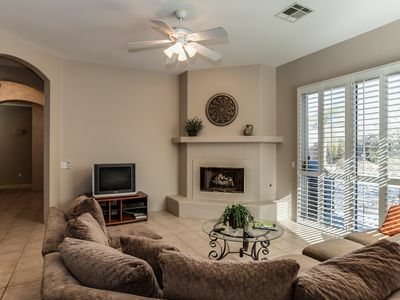 You will feel like you stepped into a magazine, but with the comforts of home! The Iron Mountain Estate is truly a luxury resort compound - everything is right there on this enormous, private yard. Surrounded by mature ficus hedging, with every amenity imaginable, and with amazing lime-green and black decor, you will feel like you are at your own private 5-star hotel at a fraction of the price! The south-facing yard is over 1/2 an acre; you have incredible sun all day long and amazing sunsets! 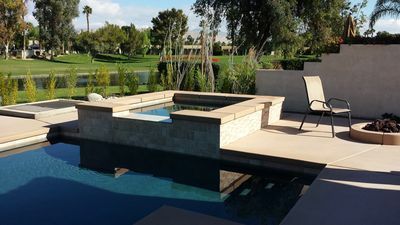 We tore out the old pool and installed a large 20x42 ft. heated pool with a 9x8 ft spa, surrounded by Queen and Washington Palms. Spend the day lounging in the pool on one of our lime green pool floats, listening to your favorite music from hard-wired Bose speakers on all 4 corners of the pool. Have a drink (acrylic drink-ware only!) at the swim-up bar right in the pool! The tanning shelf in the pool is only 12-inches deep - perfect for letting little ones splash around or for cooling off while getting a great tan! Imagine reading a book on one of 10 custom-covered Cast Aluminum chaise lounges under a commercial grade umbrella while the kids play in the pool! 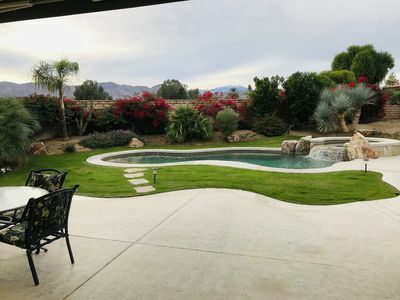 Nobody will be bored at the Iron Mountain Estate: Play a game volleyball in the pool (steel posts)with the built-in volleyball net (removable), or play a game of volleyball/badminton on the full-size grass court in the backyard. Remove the volleyball net for a game of soccer - the grass area is over 2000 square feet!!! Play a game of pool at the custom outdoor tournament size pool table located right off the pool deck. Or, have a ping-pong tournament at the outdoor ping-pong table. After you go for a hike on the nearby Santa Rosa Mountains, come back and have a relaxing spa to soothe your muscles! In the evening, you can still play volleyball, pool or ping-pong as there are lights and heaters above the pool table (with music of course!) 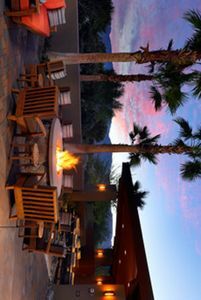 You can sit at one of two natural gas fire-pits and have a sip of your favorite cocktail! The professional landscape lighting provides the perfect ambiance for spending your evening outdoors! The Games Cabana is 300 square feet of air-conditioned private space! It's carpeted with a large HDTV, a foosball table, comfortable seating, and plenty of toys. Your kids will spend hours in the Cabana! You will love the enormous outdoor kitchen with a natural gas barbecue, a searing grill, a gas cook-top with 4 burners, and a sink. Dine outdoors 365 days/year as the outdoor dining area and kitchen is covered by a trellis and with powerful outdoor heaters and speakers. The extra-large dining table seats 12 persons plus 4 stools at the bar. 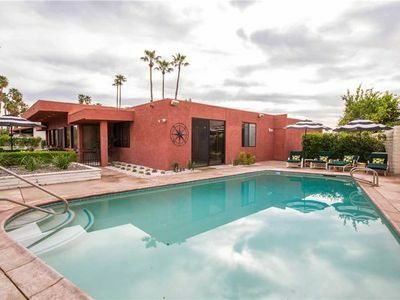 There are 3 bedrooms in the main house (3 kings) and 2 bedrooms in the casita (1 king and the other with 2 queen beds). 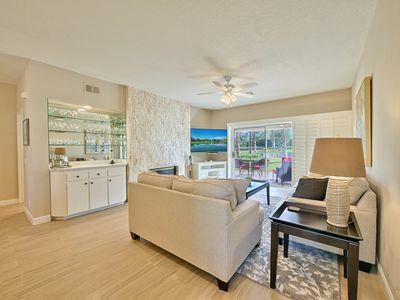 All 5 bedrooms have brand new carpeting, pillow-top extra plush mattresses, large closets, a flat-screen HDTV, ceiling fans, luxury linens and beautiful furnishings and decor. Four of the bedrooms have their own separate bathrooms. The king bedroom in the main house uses the main bathroom. 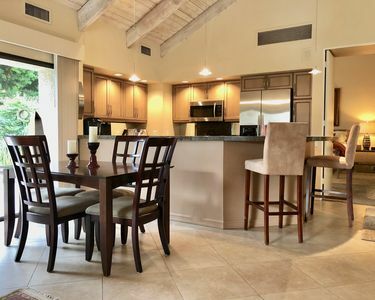 All 5 bathrooms have beautiful Porcelanosa tiles, Kohler fixtures, stunning crystal lighting, huge showers with Starfire glass enclosures, 2 shower-heads, carrara marble countertops and travertine floor tiles. Four of the bathrooms have double sinks. The Master Bathroom is incredible - it's huge, with a steam shower with 3 showerheads, and a huge soaker tub under a gorgeous crystal chandelier. 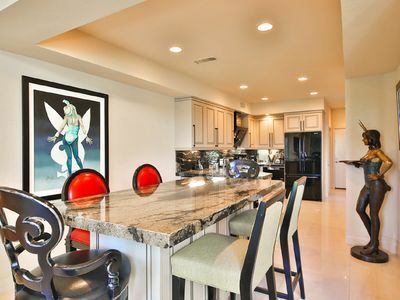 The Kitchen has all new cabinetry, an 8-foot island and new quartz white counter tops. There are 2 dishwashers, a 50-lb ice machine, large built-in refrigerator and freezer, a garburator, a boiling hot and cold filtered water dispenser, a microwave, a gas cooktop and an electric oven. Most importantly, there are 2 enormous picture windows to maximize the light and views. With tons of counter-space, the whole family can cook a meal together! We've fully stocked the kitchen with every small appliance and utensil you could ever need to cook a large family meal. 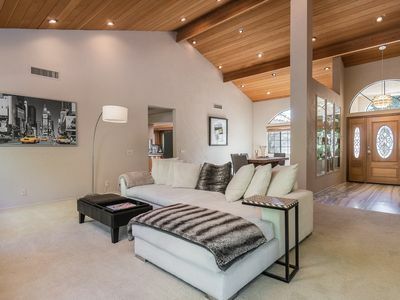 The main living area of the house is an open concept; it's exactly the configuration you want for a vacation home. The living room has the most comfortable deep-seat sofa, love-seat and chair that you've ever sat in! It's 45-inches deep and filled with down - you'll never want to get up! You can relax, turn on the gas fireplace and watch a movie on the HDTV held in a super cool easel. 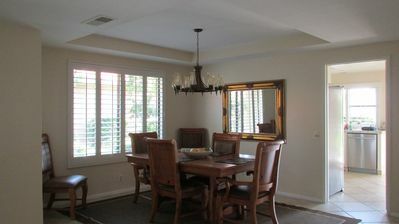 The distressed wood Restoration Hardware extended Dining Table and French linen chairs seats 12. You'll dine under Incredible Restoration Hardware crystal chandeliers beside an over-sized Trestle mirror so that everybody enjoys the views of the backyard and the Santa Rosa Mountains. Of course, you'll be listening to your favourite music hard-wired in through the Sonos sound system and Bose ceiling speakers. Enjoy Free WiFi and free long-distance anywhere in the US and Canada. A printer and some essential office supplies are available for your use as well as a large desk in the master bedroom. We accept reservations through VRBO on-line. In order to reserve, we require 50% of the total cost of the reservation along with receipt of a completed and signed rental agreement. We are not able to hold any reservations pending receipt of funds or the contract as our properties book up very rapidly. Please be advised that VRBO processes payments through Europe and as a result, your credit card provider may charge you an international transaction fee. 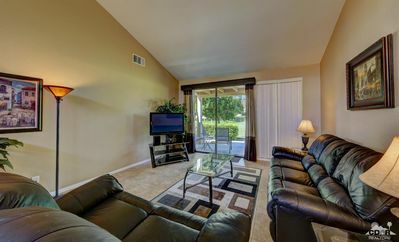 Our Palm Desert Vacation Rentals are almost always booked with a guest checking out in the morning and another guest checking in that evening. 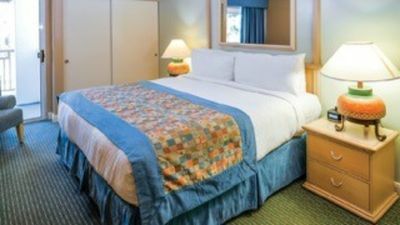 Our properties take approximately 5 hours to clean, and to wash, dry iron and replace all the linens and towels. Therefore, our check-in time is 5:00 pm and our check-out time is 11:00 am. Occasionally, we can offer an earlier check-in time or a later check-out time but only if nobody is checking in or out on the same day. If you wish to guarantee a check-in time prior to 5pm on the day of your arrival, the only way to do so is to book the property for the prior night and then you can check in at any time after 5pm the day prior to your arrival. Likewise, if you wish to check-out after 11am, the only way to do so is to book the property for the next day as well and then you can check-out at your leisure. It is our priority to make your stay at our home as peaceful and enjoyable as possible. The Iron Mountain Estate is located in a residential neighborhood where it is important to respect our neighbors. No outside noise is permitted after 10pm. No parking on the street. No events or parties are permitted. No additional persons permitted other than those listed in rental contract unless specifically authorized in writing by the owners. $1000-$5000 fines will be levied by the City for breaches of any by-laws. All fines plus an administration fee of $500/fine as well as any extra charges incurred will be deducted from the Damage Protection Deposit before any refund is issued. 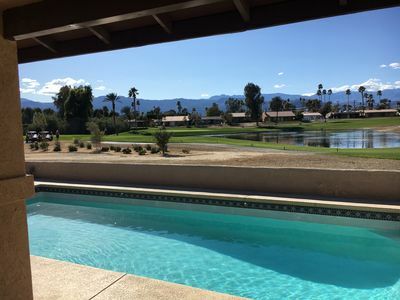 All of our properties are subject to the rules in the Rental Contract as well as the Palm Desert Short Term Rental Rules. No events, disruption of the neighbors or parties of any kind are permitted at any of our homes. We expect our renters to provide the utmost of respect to the property and to the neighbors. 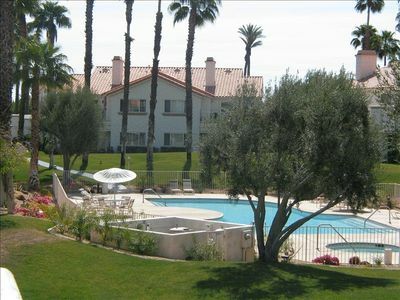 Palm Desert Short Term Rental Licence #42632. Our Cancellation Policy is in essence as follows: if a guest cancels, we will refund up to 90% of the amount paid to date if we secure a replacement reservation. VRBO fees are non-refundable. See our Rental Contract for the complete Cancellation Policy. We have 6 Holiday Home Rentals that we own and operate ourselves. 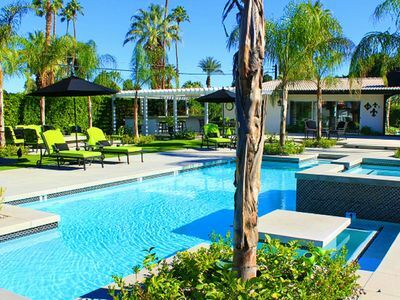 5 are in Palm Desert, all within walking distance to El Paseo with large pools, spas and mountain views and one is in Whistler, BC, Canada. Northwood Chalet Whistler: 5 bedrooms/4 baths, on Nicklaus North Golf Course with breath-taking views of Blackcomb and Wedge Mountains. 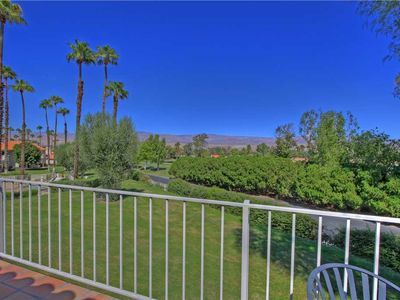 Your paradise awaits - Million dollar mountain view with golf course backyard! 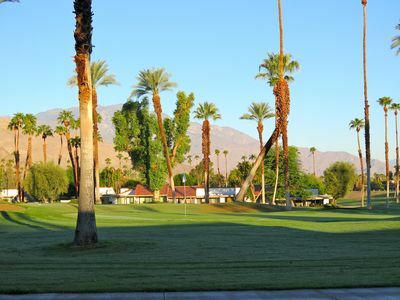 Palm Desert Dream Getaway on Palm Valley Golf Course!